The gingiva is the part of the oral mucosa that covers the alveolar processes of the jaws and surrounds the necks of the teeth. Normal gingiva covers the alveolar bone and tooth root to a level just coronal to the cemento enamel junction. The gingiva is divided into marginal, attached and interdental areas. The marginal or unattached gingiva is the terminal edge or border of the gingiva surrounding the teeth in collar-like fashion. The gingiva sulcus is the shallow crevice or space around the tooth bounded by the surface of the tooth on one side and the epithelium lining the free margin of the gingiva on the other side. The attached gingiva is continuous with the marginal gingiva. It is firm, resilient and tightly bound to the underlying periosteum of alveolar bone. The interdental gingiva occupies the gingiva embrasure. It can be pyramidal or can have a col shape. Gingiva is composed of the overlying stratified squamous epithelium and the underlying central core of connective tissue. Functions and features of gingival epithelium are mechanical, chemical, water and microbial barrier signalling functions. The major components of the gingival connective tissue are collagen fibres (about 60% by volume), fibroblasts (5%), vessels, nerves and matrix (about 35%). The gingival fibres are arranged in three groups. That is gingivodental, circular and transcepta. The earliest signs of gingival inflammation preceding established gingivitis are increased gingival crevicular fluid production rate and bleeding from the gingival sulcus on gentle probing., Probing pocket depth measurements by themselves are of limited value for the assessment of the extent and severity of gingivitis. Gingival bleeding on probing (BOP) indicates an inflammatory lesion both in the epithelium and in the connective tissue that exhibits specific histologic difference compared with healthy gingiva. The scoring was done on all the teeth of maxillary and mandibular arch. Plaque was assessed on distofacial, facial, mesiofacial and lingual surfaces. A mouth mirror and a dental explorer were used after air drying of the teeth to assess plaque. India has a very long history of using herbal drugs as the main course therapy for treating a number of diseases. The herbal drugs have made their importance felt in the past few decades whose prevalence is continuously increasing in both developing and developed countries due to their natural origin and lesser side effects. Plantago is the most commonly used medicine in Europe, Japan and North America. In India, it is found in temperate and alpine Himalayas, Assam, Konkan, Western Ghats and Nilgiris. In Hindi, it is known as Luhuriya. It is a perennial herb with an erect stout rootstock. Leaves alternate, radical, 2.5–12.5 cm long, ovate or ovate-oblong, obtuse or subacute, entire or toothed, nearly glabrous, base tapering and decrement into the petiole, 3–7 (commonly 5) nerved. Flowers scattered or crowded in long slender rather lax spikes, 5–15 cm long, bracts 1.5–2 m long, shorter than the calyx, broadly ovate-oblong, obtuse or subacute with broad scarious margins. Fruit is like a capsule ovoid 3–4 mm long, glabrous. Seeds are 4-8 angled, rugulose, dull black, 0.85 mm long. It contains iridoids such as aucubin, flavonoids, tannins, plant acids and mucilage. Homoeopathic drug Plantago is made from the whole plant. It was proved by Dr. Alfred Heath. It has a considerable clinical reputation in the treatment of earache, toothache and enuresis. The seeds act as tonic and stimulant and are a useful remedy for dysentery. Leaves and roots are astringent and also used in fever. The leaves are applied to bruises. It is used in case of earache and sensitivity of teeth to touch. Toothache is better while eating, profuse flow of saliva. It is also used for itching, burning, urticaria, chilblains, nocturnal enuresis, in ears. Neuralgic earache and pain go from one ear to other through the head. Otalgia along with toothache. Nose discharges liquid, yellow in sudden onset. Greek physician described the traditional use of Plantago in wound healing in the first century AD. This plant enhances the production of nitric oxide and tumour necrosis factor alpha, which protect the host against the development of infection and tumours. This tumour necrosis factor alpha is one of the essential mediators of host inflammatory responses in natural immunity. Whole plant is used as an anti-inflammatory, antiulcer, anaesthetic and analgesic. In a study, endotoxin-free methanol extract of Plantago major leaves, at doses of 50, 100, 250 and 500 mg/ml, was examined for immunoenhancing properties. This result showed that this plant possessed immunomodulatory activity. For this reason, this study set out to investigate the efficacy of Plantago whole plant in the reduction of plaque and gingivitis  in subjects with established gingivitis. The study was conducted on the cases available from December 2016 to June 2017. The present study was carried out in the Department of Practice of Medicine (Dental) at Sri Ganganagar Homoeopathic Medical College, Hospital and Research Center, Rajasthan, India. Thirty patients (15 males and 15 females with a mean age of 28.8 ± 3.28 and range between 18 and 36 years) were enrolled in this study. The eligibility criteria were: age more than 18 years with a minimum of 15 teeth and the presence of established gingivitis [Figure 1] and [Figure 2]. Any history of allergies to herbal medicines. Verbal and written informed consent was obtained from all the subjects. Thirty gingivitis patients (15 test group and 15 controlled group) were included in this clinical study. These thirty cases were allocated randomly using coin toss method. Local Ethical Committee permission was taken and diagnosis was made according to dental clinical history with necessary investigations. The Plantago extract toothpaste was prescribed for the above cases and followed for a period of 6 months (December 2016 to June 2017). The data were presented according to standardised case record. Plantago brought from a registered herbal medicine shop (Rajasthan herbal shop, Sri Ganganagar, India) and specimen was deposited in the Department of Pharmacy, Tantia University, Sri Ganganagar, Rajasthan, India. The extracts were isolated by maceration of Plantag o with ethanol. After filtering and drying the extract, toothpastes containing 5% Plantago extract were prepared which is used for the test group. Commercially available toothpaste in a label-free tube was used for the control group which is alcohol free. Patients were supplied with the assigned oral hygiene kit, toothpaste and a soft-bristled toothbrush. All the patients were instructed to use the oral hygiene items. They were asked to brush their teeth twice daily using the bass technique for approximately 1–3 min. The baseline plaque, gingival and bleeding indices , were measured on all teeth at the buccal, mesial, distal and lingual aspects, with the exception of third molars. This study was conducted over a period of 6 months. Clinical follow-up was performed at the end of 3 months and 6 months after initial use of Plantago. Throughout the study, all measurements, instrumentations and clinical data were collected by the investigator. The collected data were analysed by mean, standard deviation and analysis of variants (ANOVA). There is no a significant reduction of parameters of PI, GI and BOP gingivitis before, during and after homoeopathic Plantago herbal toothpaste. Baseline data for control (Group I) and test groups (Group II) were analysed on a subject wise basis as shown in [Table 1]. Baseline demographic characteristics were tested using the independent t-test. They were found to be similar and no statistically significant difference existed between the groups [Table 1]. Mean ± SD baseline data, PI is 1.72 ± 0.07, GI is 1.9 ± 0.14 and BOP is 1.8 ± 0.43. In Plantago group, PI is 1.73 ± 0.08, GI is 1.9 ± 0.12 and BOP is 1.87 ± 0.37. Thirty diagnosed cases of gingivitis complaints were studied for a period of 6 months. PI, GI and BOP checked in every 3 months and 6 months (before, during and after the treatment). PI in placebo group (baseline) was 1.72 ± 0.07, after 3 months placebo group 1.62 ± 0.09 and after 6 months 1.51 ± 0.103. Baseline of PI is 1.73 ± 0.08 (before), after Plantago application within 3 months 1.29 ± 0.09 (during) and after 6 months 1.87 ± 0.37. P value showed in 3 months and after 6 months was 0.0001 [Table 2]. GI of placebo group in baseline is 1.9 ± 0.014, after 3 months is 1.80 ± 0.15 and after 6 months is 1.71 ± 0.141. In baseline of GI is 1.9 ± 0.12 (before), after Plantago application within 3 months 1.34 ± 0.13 (during) and after 6 months 1.27 ± 0111. P value showed in 3 months and 6 months was 0.0001 [Table 2]. BOP of placebo group in baseline is 1.8 ± 0.43, after 3 months is 1.73 ± 0.35 and after 6 months is 1.57 ± 0.497. However, baseline of BOP is 1.87 ± 0.37 (before), after Plantago application within 3 months 1.35 ± 0.28 (during) and after 6 months 1.18 ± 0.26. P value showed in 3 months and after 6 months of BOP was 0.0001 [Table 2]. Repeated-measures ANOVA was performed comparing data obtained at baseline, at 3 months and 6 months, which also revealed significant difference between the two groups, both in PI (F = 14.0226), P = 0.0001, GI (F = 71.0768), P = 0.0001 and BOP (F = 70.8665), P = 0.0001, which denotes a significant reduction in all the clinical parameters which includes GI, PI and BOP at baseline, 3 months and 6 months after homoeopathic administration with Plantago in gingivitis [Table 2]. It was observed that there was a significant reduction before, during and after in PI, GI and BOP values in Plantago group (Group II). Until now, local application of drug therapy has not been widely used in patients with gingivitis. In this study, we examined a dastifrice form containing plants' extracts to evaluate its effects on gingivitis. 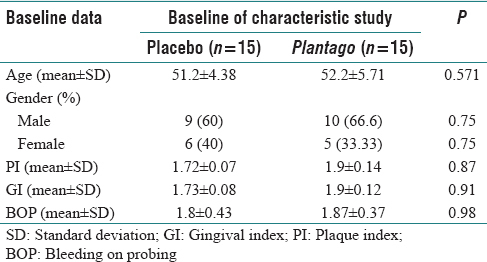 The results of this study suggest that the Plantago is safe and effective in the treatment of gingivitis as compared to the placebo group [Figure 3]. There was mild reduction in the PI, GI and BOP in the control group when compared to the test group of regular twice daily toothbrushing. Some studies have demonstrated that different formulations of chlorhexidine as mouthwash, collagen gel and toothpaste are effective in treating gingivitis. In the present study, we designed a different formulation of Plantago extract in the toothpaste base as a vehicle. We believe that the application of toothpaste is compatible with daily activities and patients will find its application convenient. The main advantage of the study is patient compliance and the low risk of systemic side effects. The periodontal infections cause serious damage to gums. Its leads to loss of alveolar bone as well as loss of teeth. The antibacterial activity of medicinal plant against anaerobic and facultative aerobic bacterial present in the oral cavity that often causes periodontal infections is very scarce. Therefore, it is suggested that more studies must be designed to find out the exact antibacterial/anti-inflammation effects of Plantago on gingivitis. The reviews also recommended that further pragmatic trails including clinical trials and observational studies been conducted. 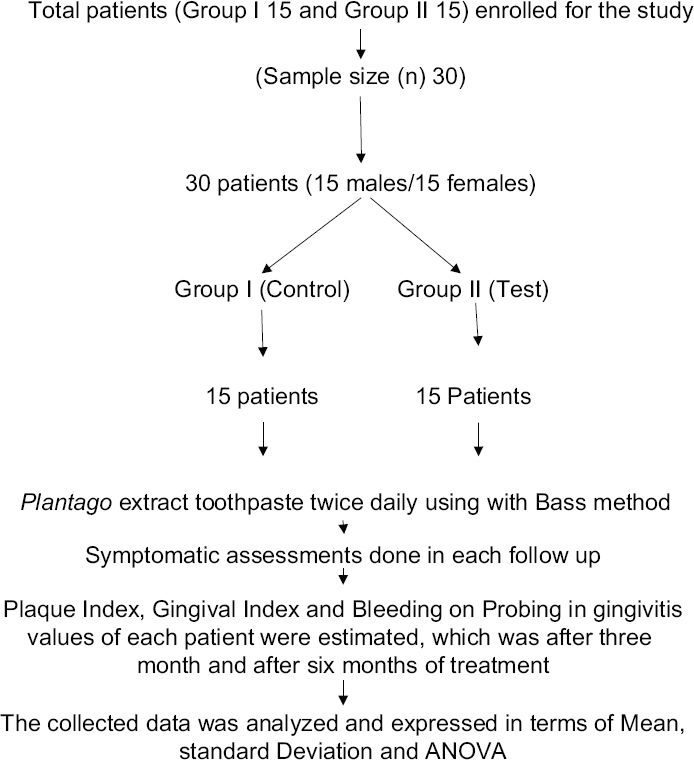 The clinical study showed significant reduction of PI, GI and BOP of gingivitis parameters with Plantago toothpaste. The sample size is small (n = 30) and duration only 6 months. We acknowledge Principal, Vice Principal, Faculty, for providing general facilities for the conduction of this clinical study. Kronfeld R. Histopathology of the Teeth and Their Surrounding Structure. Philadelphia: Lee & Febiger; 1939. Caffesse RG, Nasjleti CE. Enzymatic penetration through intact sulcular epithelium. J Periodontol 1976;47:391-7. Saglie R, Newman MG, Carranza FA Jr., Pattison GL. Bacterial invasion of gingiva in advanced periodontitis in humans. J Periodontol 1982;53:217-22. Schwartz J, Stinson FL, Parker RB. The passage of tritiated bacterial endotoxin across intact gingival crevicular epithelium. J Periodontol 1972;43:270-6. Page RC. Gingivitis. J Clin Periodontol 1986;13:345-59. Page RC, Schroeder HE. Pathogenesis of inflammatory periodontal disease. A summary of current work. Lab Invest 1976;34:235-49. Page RC, Schroeder HE. Periodontitis in Man and Other Animals. A Comparative Review. Basel: S. Karger; 1982. Lindhe J, Hamp SE, Loe H. Experimental periodontitis in the beagle dog. Int Dent J 1973;23:432-7. Hock J, Niki K. A vital microscopy study of the morphology of normal and inflamed gingiva. J Periodontal Res 1971;6:81-8. Payne WA, Page RC, Ogilvie AL, Hall WB. Histopathologic features of the initial and early stages of experimental gingivitis in man. J Periodontal Res 1975;10:51-64. Flieder DE, Sun CN, Schneider BC. Chemistry of normal and inflamed human gingival tissues. Periodontics 1966;4:302-7. Freedman HL, Listgarten MA, Taichman NS. Electron microscopic features of chronically inflamed human gingiva. J Periodontal Res 1968;3:313-27. Schroeder HE, Graf-de Beer M, Attström R. Initial gingivitis in dogs. J Periodontal Res 1975;10:128-42. Hanioka T, Shizukui S, Tsunemitsu A. Changes in haemoglobin concentration and oxygen saturation in human gingiva with decreasing inflammation. J Periodontol 1991;62:366. Hancock EB, Cray RJ, O'Leary TJ. The relationship between gingival crevicular fluid and gingival inflammation. A clinical and histologic study. J Periodontol 1979;50:13-9. Lindhe J, Parodi R, Liljenberg B, Fornell J. Clinical and structural alterations characterizing healing gingiva. J Periodontal Res 1978;13:410-24. Larato DC, Stahl SS, Brown R Jr., Witkin GJ. The effect of a prescribed method of toothbrushing on the fluctuation of marginal gingivitis. J Periodontol 1969;40:142-9. Lenox JA, Kopczyk RA. A clinical system for scoring a patient's oral hygiene performance. J Am Dent Assoc 1973;86:849-52. Greenstein G, Caton J, Polson AM. Histologic characteristics associated with bleeding after probing and visual signs of inflammation. J Periodontol 1981;52:420-5. Boericke W. Pocket Manual of Homoeopathic Materia Medica and Repertory. New Delhi: B. Jain Publication Pvt. Limited; 1999. p. 521. Samuelsen AB. Structural features and anti complementary activity of some heteroxylan polysaccharide fractions from the seeds of Plantago major L. Carbhohydr Polym 1999;38:133-43. Nathan CF, Hibbs JB Jr. Role of nitric oxide synthesis in macrophage antimicrobial activity. Curr Opin Immunol 1991;3:65-70. Grigorescu E, Stănescu U, Bâsceanu V, Aur MM. Phytochemical and microbiological control of some plant species used in folk medicine. II. Plantago lanceolata L. Plantago media L. Plantago major L. Rev Med Chir Soc Med Nat Iasi 1973;77:835-41. Gomez-Flores R, Calderon CL, Scheibel LW, Tamez-Guerra P, Rodriguez-Padilla C, Tamez-Guerra R, et al. Immunoenhancing properties of Plantago major leaf extract. Phytother Res 2000;14:617-22. Carranza F, Klokkevold PR, Newman MG, Takei HH. Clinical features of gingivitis. Textbook of Clinical Periodontology. Cha. 22. Elsevier, Philadelpha, PA; 2002. p. 362-72.